If you're just getting started with modeling for analysis and design, this session is for you! We'll step you through how to create your first modeling project in Enterprise Architect. We'll also explain some basic modeling concepts along the way, such as how elements in the model hierarchy relate to the diagrams you draw. What version of Enterprise Architect were you using? Enterprise Architect 13.5, Build 1351. I used a trial installation of Enterprise Architect for this demonstration. You might like to browse the various models contained in the EA Example project. You can access the EA Example project via the ribbon Start | Help | Open the Example Model. You can also find sample models posted with some of our previous webinars – see our Webinar Library. Will there be future webinars that demonstrate team collaboration, such as collaborating amongst networked teammates? Are you going to follow this up with other getting started type subjects? This has been a great intro. Yes. For example, our next webinar will discuss the basics of UML Class modeling. You can register for that via the webinar registration page. Will there be upcoming webinars that show more advanced modeling using Enterprise Architect? Yes. Our webinars cover a range of modeling skill levels. You might be interested in some of the specialized topics we’ve covered previously, as listed in our Webinar Library. This is the first time I’m seeing Enterprise Architect. What’s your best advice to get up to speed? Digesting this and other introductory webinars is a good start. You can view the other beginner-level presentations in our Webinar Library. Additional free online learning resources are available from our Resources & Tutorials page. These resources are most effective if you use them with your own installation of Enterprise Architect – so download and install the Trial edition as well. Our many partner organizations also provide training programs for beginner levels and beyond. Is it possible to watch previous webinars (from an archive)? Yes. Please see our Webinar Library. Do you have example case studies which can be used to learn about modeling in Enterprise Architect? Yes. Please see our Case Studies page. Are there any books on Enterprise Architect? Yes. Some examples are listed on our E-Book page. You might also be interested in the resources on our White Paper Repository. Any plans for porting Enterprise Architect to macOS? You can run Enterprise Architect on macOS using WINE. For details, see our instructions page Installing Enterprise Architect inside Wine or CrossOver. Currently, there no plans for a native installer for macOS. How did you get the Primary Use Cases tab? I double-clicked that diagram node in the Project Browser. That opens the diagram tab in the main view. See the video at 12:55. For a more general explanation about opening diagrams, see the video at 5:48. I selected Carbon [as the theme in the Application Look dialog]. I don't see the option for searching commands on top of the ribbon. Why? The Find Command control positioned next to the ribbon categories is only available in the later Microsoft Office Themes. It is a known limitation. For all themes, however, you can access equivalent functionality inside the main application menu (top left icon) using the Search control at the bottom. Can you show the documentation settings again? See the presentation video at 19:02. There is an Options tab in the Generate Documentation dialog. I have a different version of Enterprise Architect (10.0.1008) with a different interface. Where is the Publish option? Enterprise Architect 10 uses a menu system instead of the newer ribbon, so it does not have a Publish ribbon option. To generate a Rich-Text Format document, use the menu: Project | Documentation | Rich Text Format (RTF) Report. To export a diagram as an image file, use the menu: Diagram | Save as Image. Is there a way to make tool tips available? If you have Enterprise Architect's Status Bar visible, the tool tips will be displayed there. The option to show/hide the Status Bar was shown in the presentation video at 4:45. I mainly create Component and Sequence diagrams. If I color a Component in one diagram, how can I keep that same color in all the other diagrams where the same element is used? You can achieve this by setting a default appearance for a given element. For details, see the Help topic Set an Element's Default Appearance. Is there a fast way to make elements the same size on a diagram? Yes. You can use tools in the Layout Ribbon to help align and size diagram elements quickly. For an example, see the presentation video at 16:30. Alternatively, you can select multiple elements on the diagram by pressing control while you left-click an element. One of the selected elements will be your reference element, against which you want to size all the others. Left-click that reference element and use the in-place formatting tools that appear beside it. You can see an example of this in the presentation video at 16:43. How do I save a diagram in different versions, such as 1.1, 1.2, etc? There are several paste options available when you drop an item from the Project Browser onto a diagram – depending on what kind of item you drop and the type of diagram you target. The ones that were shown in this webinar were Link, Instance (Object) and Child (Generalization). As mentioned in the presentation, choosing Link, results in a reference to the original model element being drawn on the diagram. 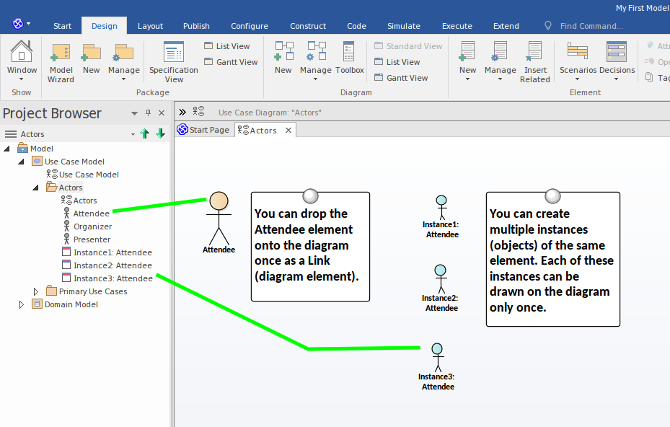 The Instance (Object) option will instantiate the element you are dropping and draw that instance for you on the diagram. The instance is a new element in the model hierarchy. The Child (Generalization) option, creates a new element that is derived from the element you are dropping. The derivation is modeled as a Generalization relationship between the parent and child elements. The new child element will be drawn on the diagram, and if the parent is already present on the diagram – the Generalization connector will be drawn as well. For more details on the paste options, see the Help topic Drop Elements from Project Browser. Should I use the Link option or select Instance of an element when using the same element across many diagrams? If you’re trying to draw a reference to the original model element, choose Link, regardless of whether the element occurs in one diagram or many. After selecting a model type, such as Use Case, can the model be modified to accommodate data or process modeling? Yes. You can add more top-level Packages for these in the Project Browser either via the Model Wizard, or creating new Packages via the context menu. You can also use a mixture of model types under any given Package as needed. Can you create requirements within the model? Is there a version of Enterprise Architect that allows UI design and linking to Use Cases? Yes. Enterprise Architect has a built-in set of tools for designing User Interfaces. User Interface design elements can be linked to Use Case elements using a Dependency or Trace connector, or they can be modeled as nested elements under a Use Case. For details on Enterprise Architect’s User Interface tools see the Help topics User Interface Diagrams and Example User Interface Diagram. Should projects be structured using Root Node or Packages? You can use Root Nodes in the Project Browser to contain separate projects. This can make a clearer distinction between projects in the model hierarchy, than if you used Packages to do the same. One advantage of having multiple Projects in the same model repository is that you can share Reference Data, such as Model Authors, between them. This is still the case regardless of whether you use Root Nodes or Packages. How can we import an object from another project? There are several ways to import objects from another project. The best method depends partly on whether you are importing from an Enterprise Architect project or another source. One common way to import model data into Enterprise Architect is to use XMI. This can work with data coming from another modeling tool, if that tool supports the XMI specification. For details, see the Help topic Import from XMI. Between Enterprise Architect projects you can simply copy and paste elements via the Project Browser. Because this uses the Clipboard, you can perform the copy/paste operation between two instances of Enterprise Architect. This approach can also be used to copy an entire Package or multiple sibling elements selected in the Project Browser. For details, see the Help topic Element Copy/Paste Submenu. Assume we have an object. How do you bring more than one instance of that object into the same model? You can create instances of elements as you drag and drop them from the Project Browser. When prompted as to how to paste the element, instead of selecting Drop as | Link as I did, you can choose Drop as | Instance (Object). You can do this multiple times to create multiple instances of an object, as illustrated in this image. Note: You cannot use the same instance of an element or multiple links to the same element on the same diagram. When you drop elements from the Project Browser onto diagrams, you choose whether to link to the original element or create a new instance of that element. How do we know in which model a particular element will be? For example, if we wish to draw a flowchart or Sequence diagram, where should we start or how do we find it? The answer depends on whether you want to create a new element for a particular type of model, or you want to locate an existing element of a particular type in the model hierarchy. Locate the Package under which you want to create the element in the Project Browser. Right-click the Package and choose Add Element from context menu. In the New Element dialog use the Toolset drop-list to choose the type of model you need. Note: You’ll find the elements related to Sequence diagrams under the Interaction category, because that is how UML 2 refers to them. Flowchart elements are contained in the category Strategic Modeling | Flowchart. The range of model types you can choose from in the Toolset drop-list is affected by which MDG Technologies (model types) that you enable for Enterprise Architect. You can enable and disable MDG Technologies via the ribbon Configure | Technology | Manage. Ensure the Diagram Toolbox is visible, by using the ribbon: Design | Diagram | Toolbox. Click the More tools button at the top of the Diagram Toolbox. Choose the type of model you need. The available Diagram Toolbox items will update accordingly. Other ways to create model elements of a particular type include using the Model Wizard, as I did in the presentation video at 3:15, and adding a diagram of the relevant type. You can add new models and diagrams via the context menu in the Project Browser. If you need to use an existing element of a particular type, you can create a search definition to search the model by element type. For details, see the Help topics Model Search and Create Search Definitions. Can you elaborate on the differences between .eap and .feap files for Enterprise Architect? Both of these are what we refer to as file-based model repositories. In each case, the file is actually a database that stores Enterprise Architect’s model data. By convention, we use the .eap extension to refer to Enterprise Architect projects that use a Microsoft JET database as the underlying file type, and the .feap extension to refer to projects that use Firebird instead. Although the differences in the implementation of the two database products may be vast, the functional differences when used with Enterprise Architect are few and minor. One difference, as noted in the presentation video, is that a Firebird repository (.feap file) supports Unicode characters, whereas you need to do some configuration to enable Unicode support with a JET database (.eap file). For details, see the Help topic Startup and the related topic General Options. How do we get Enterprise Architect to work with a single SQL Server database repository? Please refer to the Help topic Create a Project in a SQL Server Database. Can you convert a feap to eap project? Yes. Use the ribbon: Configure | Model | Transfer | Project Transfer. For details, see the Help topic Project Data Transfer. How do we track changes? One way to enable Enterprise Architect’s auditing feature. Another approach is to use Baselines on Packages. For details, see the Help topics Auditing and Baselines. Can we share projects? Is there any format change required when sharing projects? You can also share projects contained in local files (.eap or .feap) when using version controlled Packages. How do you organize versioning of the models? For instructions, see the Help topic Version Control. You can use Enterprise Architect’s Document Artifact elements to contain sections of text. You can also attach Linked Documents to elements and Packages, such as the Package containing your Use Case diagram. You can include these documentation elements in generated reports. For details, see the Help topic Reporting Linked Documents. Will there be an updated [webinar] session on creating customized documentation? Can I create an Enterprise Architect model and make it visible in Visio? There is no automated way to do this out-of-the-box. Because Enterprise Architect supports a rich set of model data for elements and relationships, any export to Visio drawings would likely result in data loss. Would you also be covering the situation where you want to present your model using PowerPoint?